3 a.m., S finishes the LST yearly question bank, feeling relatively proud of herself. Then she realizes. Even Current Affairs didn’t make her fall asleep. No way is she getting a good night’s sleep now. C wakes up at about 7. She realizes that April has gone by too fast. She wonders if the world is conspiring against her. She tends to do that. People often call her a drama queen. S wakes up after 9, wondering who the head of World Bank is. She doesn’t know whether to be happy that she remembers, or rue the fact that this is what her life has come down to. “Ae Mere Watan Ke Logon” starts playing in her head, sounding strangely poignant. C plans, analyzes and panics. That’s how she stays calm. S doesn’t bother trying to stay calm. She’s hopping from one foot to another and singing along to Crawling, Change, In The End and 24 all the way into the exam hall. The last one, particularly, feels especially relevant. In the hall, the chief invigilator decides he needs to give C a lecture on how she shouldn’t be so tensed (“It’s just an exam!”), just because she asked to go to the washroom. S is shocked when the glass partition of her desk moves when she places her hand on it. It’s the last spark of feeling she has for the next 3 hours. She stares at the guy who openly broke his seal early. Then at the invigilator yelling at the said guy. Then at the smirk on the face of the guy’s neighbor (“One down!”). Then at the seconds ticking by on her borrowed digital watch. Maybe she should’ve kept her own, non-second-hand-having analogue watch. Too late now. At 3:02, C looks around the hall. Everyone looks shocked. Bit of relief. A little while later, S wonders if something about Aristotle happened recently. She still has hope at that point of time. Five minutes, and all that’s going in her head is: “They lied to us. They blatantly, unashamedly, lied to us.” She wonders what excuse they’ll come up with this time. Turns out they aren’t making any excuses cause according to them, nothing happened. When C reaches the Austin question, she wonders if she’s spent the past hour writing the LLM paper. She flips back to make sure it has “undergraduate” written on it. Then she stares at the question again. Austin. 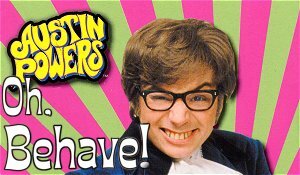 Austin Powers. And suddenly, she can hear him in her head, “Oh, behaaaave”. She giggles. It suits the paper so well. The 3 other people around her table glare at her. After the exam, C is laughing. It was so tragic, it was funny. Driving out of NALSAR, S wonders if she’ll ever step foot in there again. After a while, though, S comes out of shock. She realizes she doesn’t have to hate committees, banks, government reshuffles, revolutions, newspapers and magazines anymore. Rejoice! She starts to feel again. Everyone passes through certain stages in their life. Shock. Disappointment. Hope. Despair. Acceptance. Philosophy. This is our philosophy stage. We couldn’t help but wonder how CLAT makes such a good metaphor for life. The essentials are decided by someone else, a higher power, whom we curse and thank in turn. We plan, decide, hope and try to chart our course through, but something unexpected just turns up from nowhere. 2 hours, or 50 years, how does it matter? What it comes down to in the end is how you react to a situation. Nothing is set in stone. If it was, that would take all the fun out. How we think, what we do, and how we react to a situation makes up a large part of how we live, and who we are. And course, remembering a funny movie always helps. P.S. We know the title doesn’t make any sense. Well, neither does life. That Austin part is so true! It summed up the all fail points of the CLAT-2012 paper.